6) Faculty of Agriculture, University of Palangka Raya, Indonesia. During 1997 and 1998 intensive land irrigation and clearance activities in Indonesia, combined with a greatly extended ENSO-related dry season, created conditions for several months of forest fires. Fires were particularly intense in the lowland peatlands of Kalimantan and Sumatra where both forest and peat fires occurred. Impacts of fire on peat swamp forests were investigated in a 25,000 km2 (2.5 MHa) study area in Central Kalimantan using LANDSAT TM/ETM and ERS-2 radar satellite images. 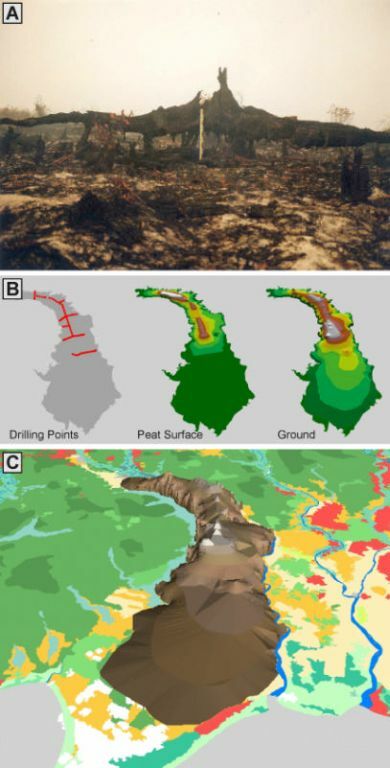 By combining data from remote sensed images with field measurements, it has been possible to determine fire impact, carbon storage in the peatlands and carbon emission by fire. Results indicate that 32 % of the study area has been fire affected (796,906 ha); the largest scars are in areas impacted by logging, forest clearance and peatland drainage. Systematic peat drillings showed that huge amounts of carbon are stored in this tropical peatland suggesting that the contribution of tropical peat to the global resource is much greater than thought previously and could be as much as 20-30% of the total. Carbon emissions from peat and forest combustion have been also significant on a global scale. A conservative estimate suggests that the thickness of peat lost by combustion during the fires averaged 0.40 m over the study site n resulting in approx. 3 Billion m3 of burned peat. Total carbon losses from the 1997 peatland fires in the study area are estimated to be in the range 0.218 to 0.491 Gt C, with the greatest contribution of atmospheric CO2 derived from peat rather than forest combustion.